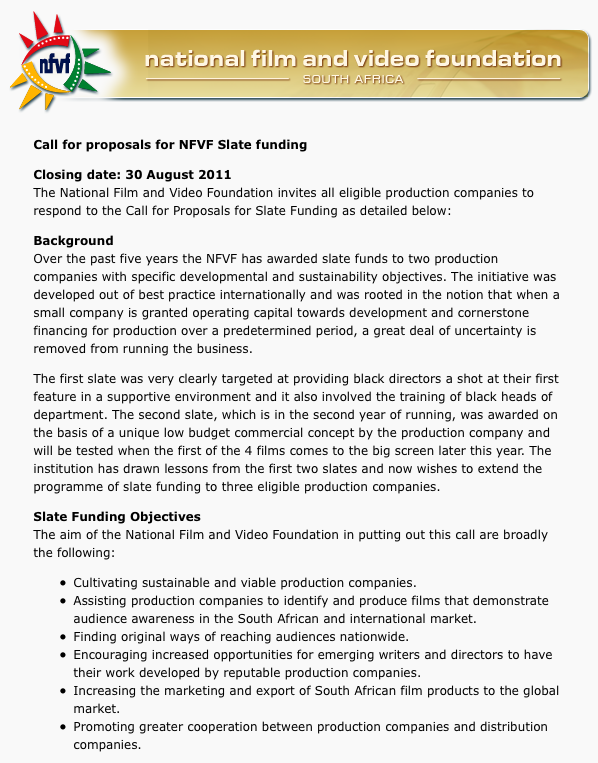 Over the past five years the NFVF has awarded slate funds to two production companies with specific developmental and sustainability objectives. The initiative was developed out of best practice internationally and was rooted in the notion that when a small company is granted operating capital towards development and cornerstone financing for production over a predetermined period, a great deal of uncertainty is removed from running the business. The first slate was very clearly targeted at providing black directors a shot at their first feature in a supportive environment and it also involved the training of black heads of department. The second slate, which is in the second year of running, was awarded on the basis of a unique low budget commercial concept by the production company and will be tested when the first of the 4 films comes to the big screen later this year. The institution has drawn lessons from the first two slates and now wishes to extend the programme of slate funding to three eligible production companies. * Cultivating sustainable and viable production companies. * Assisting production companies to identify and produce films that demonstrate audience awareness in the South African and international market. * Finding original ways of reaching audiences nationwide. * Encouraging increased opportunities for emerging writers and directors to have their work developed by reputable production companies. * Increasing the marketing and export of South African film products to the global market. * Promoting greater cooperation between production companies and distribution companies. 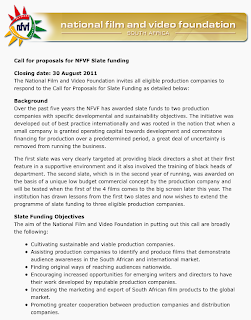 To view the full details, please visit the NFVF's web site.